I’m happy to present you my new calligraphic handwritten script font Sadlyne. It will be best for your wedding stationery and wedding monograms! Sadlyne is an elegant, feminine and graceful calligraphic handwritten script font, plus a Symbols font with 36 lovely hand-drawn flourishes and illustrations and BONUS! Hand-drawn vector Toscana landscape for your wedding presentation! 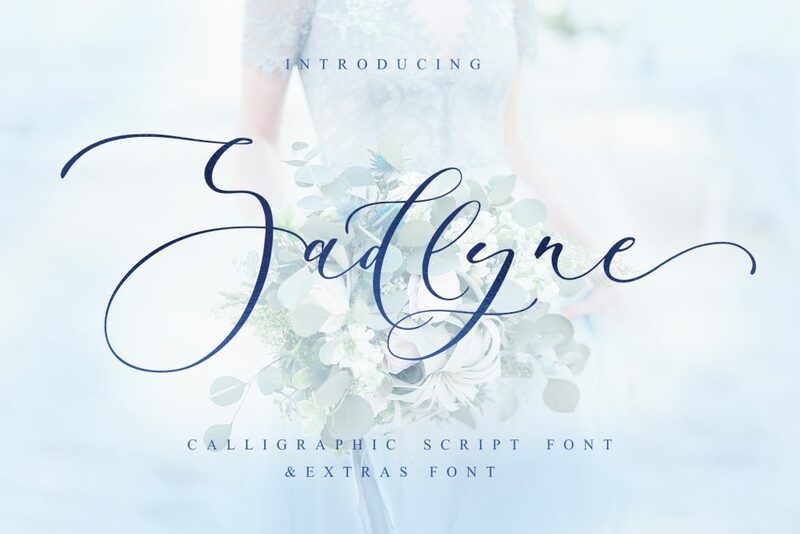 Sadlyne script is perfect for branding, logos, wedding stationery, social media, packaging, and other projects that require an elegant touch. Sadlyne script contains a full set of uppercase letters and 5 full sets of lowercase letters, (standard, alternative, and initial, final form and flourish foarm. To make a needed form just type a letter with a number such as a1, a2 a3…) and 27 ligatures – which can be used to create a handwritten calligraphy look. Sadlyne Symbols is a font with over 36 hand-drawn elements, illustrations, and swashes and can help to make your design more original. Combine and arrange swashes and illustrations to create your own designs and make borders, frames, dividers, logos and more (just use A-Z and a-z keys in the included Sadlyne Symbols font). A different symbol is assigned to ever uppercase or lowercase standard character so you do not need graphics software just simply type the letter you need. BONUS! Hand-drawn Toscana landscape in vector EPS10 and PNG formats! A font family published by Ira Dvilyuk on Monday, July 16th, 2018 that has 1,046 views so far.